The Export Movie window lets you export your storyboard and animatic as a movie file which you can share and play back. You can export your movie file in different formats (QuickTime, SWF movie (Flash), jpeg, targa) and as image sequences. Lets you specify the location and name of the folder for the exported file. Lets you set the file name pattern. Leave this field blank to use the default pattern. Lets you specify the format of the exported movie. Choices include: QuickTime (.mov), Flash (.swf), JPEG (.jpeg) and Targa (.tga). 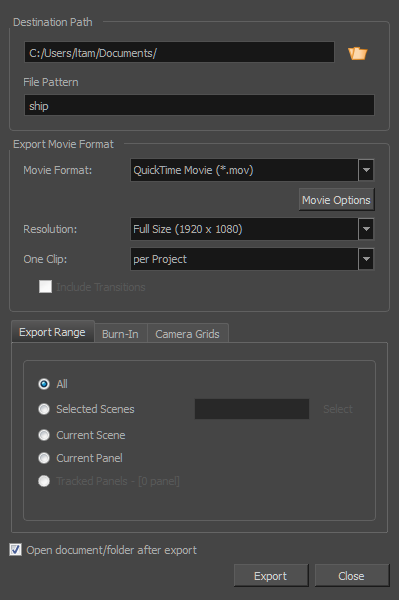 Opens the Movie Settings dialog box which lets you set the parameters for export a QuickTime movie. Some of the QuickTime movie settings will be overridden by the Storyboard Pro project or export settings. See . Sets the resolution to be a quarter size, half size, or full size of the current storyboard resolution. Exports more than one QuickTime movie clip per scene (which might contain more than one panel) e.g. to obtain better granularity during editing since the storyboard will have smaller movie clips. Includes transitions in your export movie files. Select this option and click Select to open the Scenes Picker dialog box in which you can select specific scenes to export. You can also select your scenes per sequences if your project contains sequences. Exports only the currently selected scene. Exports only the currently selected panel. Exports panels are marked as tracked. The number of tracked panels will appear beside the option—see About Track Changes. Prints the project timecode on the video as an overlay on your video. Prints the scene names and panel numbers as an overlay on your video. Prints an additional duration on your video, defined by the Units and Repeat menu. Displays additional duration information using Time Code or Frames units. Displays additional duration information per panel, scene or sequence. Prints the safe area on your video. Prints the 4:3 safe area on each panel of your storyboard that has a camera movement. Prints the 4:3 area on each panel of your storyboard that has a camera movement. Opens the folder after export.